In partnership with Enactus OC, 8 Ford vehicles were loaned to offer a Safe Ride Home by donation to attendees of the annual Bollywood Bang Event. Proceeds went to Enactus' efforts to run social, economic, and environmental programs throughout Vernon. The annual 'Breakfast in a Box' raises funds for KidSports programs in Vernon. KidSport assists with registration fees and sports equipment costs for youth in need. Watkin Motors covered the costs of food and drinks for this event. This annual event raises much-needed funds for the various programs that Kindale Developmental Association operates in the North Okanagan. This year, they partnered with Special Olympics BC, Vernon. Watkin Motors was an 'Eagle Sponsor' for this event, which included a hole sponsorship. Always a great community event, Watkin Motors has been the major sponsor of this event for many years. 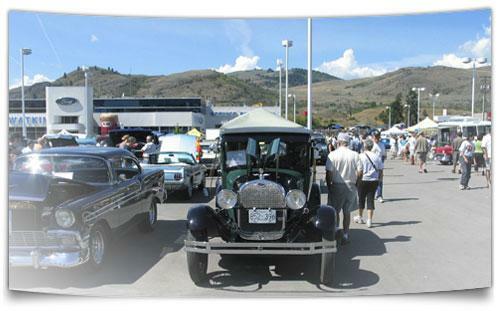 The annual event includes open car shows throughout Vernon, live music, and a Saturday afternoon 'country cruise' which starts at Watkin Motors. Butcher Boys in Vernon is hosting the 10th Annual Hospice Fundraiser, an event where proceeds are donated to the North Okanagan Hospice Society. Watkin Motors contributed items from our Parts & Accessories department for the silent auction at this event. The VJHF Chairty Classic is the North Okanagan's premier golf tournament supporting the best in healthcare in our region. Watkin Motors signed on as a Hole Sponsor for this event and to add some fun to it, we operated a Speed Hole Challenge! Congratulations to Team Nixon Wenger who had a low time of just 00:33! Each member of their team won a 'Gold Clean' 29th Street Autoplex! We will be loaning out 20 New Ford Vehicles including a mix of Ford Cars, Trucks and SUVs to transport the athletes to events during the games. From September 20th to October 2nd, these vehicles will have Special Offers including a FREE Two-Year Limited Maintenance Package included with the purchase of one of these New Vehicles! The Vernon Women's Transition House Society provides shelter, counselling, child and youth advocacy and we have teamed up to help them out! If 50 vehicles are sold, we will donate $5,000! Plus, for EVERY Retail Repair Order in the Service Department, we will donate $10. Saturday, September 23rd, 2017 from 11:00 a.m. to 2:00 p.m. The Vernon Lions Club will be hosting a barbecue at the dealership to help celebrate our 102nd Anniversary! Stop by between 11:00 a.m. to 2:00 p.m. and join us in celebrating 102 years proudly serving Vernon! Below you will find some of the organizations we have been working with to make our community a better place.